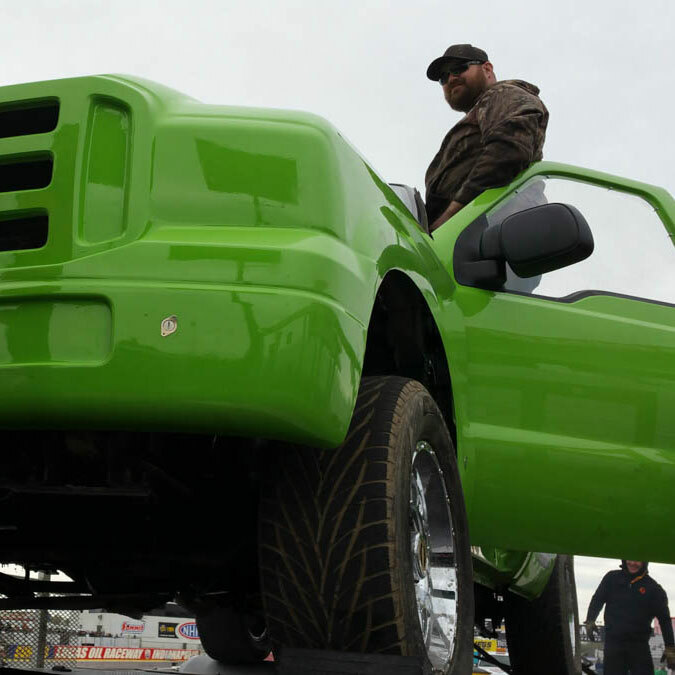 Affectionately known as the Canadian Redneck, Shawn Ellerton and his DKG Racing team are two-time competitors in the Ultimate Callout Challenge competing with their 2004 Ford F-250 that is powered by an infamous 6.0L Power Stroke diesel engine. Ellerton brought his truck and a great never say die attitude with him to the original UCC event in Salt Lake City, Utah all the way down from Canada. He finished a respectable 16th place overall in 2016 with over 1,300 HP on the dyno and an 11.4 second 1/4-mile pass but the drag truck had a hard time on the pull track dragging the sled just 163 feet. Ellerton had high hopes for the 2017 UCC competition and finished midpack on the drag strip on the first day before losing the engine to a catastrophic failure on the dyno on day two. He did manage to put over 1,000 HP to the dyno rollers before it scattered pieces on the deck of the dyno which gave him enough points for a 20th place finish overall despite not competing in the sled pull. Not breaking with his never give up attitude, Ellerton and his team have rebuilt and are coming back to Indianapolis seeking redemption to show that a small team with big dreams and an old 6.0L Power Stroke can still compete with the big dogs of diesel competition. The engine uses a set of Wagler Competition Products rods that swing Diamond pistons through the bores. A set of DFC heads cap the short block while 600cc Warren Diesel injectors deliver large volumes of fuel to the engine with a FASS system feeding the high pressure system. To keep up with the fuel delivery a trio of BD Diesel turbos with twin S480s feeding a 76SXE provide tons of air volume. Of course Ellerton also relies on a bunch of nitrous oxide to help make even more power with the 6.0L Power Stroke engine. The engine is backed by a NADP/NAPC race built transmission to handle the power and put it to the ground at all four corners. To better attack the sled pull Ellerton has secured a Dana 80 rear end along with 4.56 gears and front and rear lockers. He also plans to run aggressive 35-inch tires more suited for pulling this time around to put up a good fight on the pull track. The DKG Racing team is comprised of a group of Redneck Canadians with a great passion for diesel motorsports that thoroughly enjoy the fierce competition and camaraderie of high level competition like they see at the UCC as well as other organizations they race with on a regular basis. Ellerton and his DKG Racing team are also supported and sponsored by BD Diesel, Dirty Canadian Oil, Innovative Diesel, Komrad Diesel, NAPC and Warren Diesel Injection. The team is looking for much better performance in 2018 and we look forward to seeing what the Canadian Redneck and his 6.0L Power Stroke will deliver for us this year when the truck hits the track, rollers and dirt on May 4th-6th 2018 at the third annual Ultimate Callout Challenge!